And the decision of Chris's design!l Sports that lab coat the nurses gave him rather well, doesn't he? Granted this character is originally from the Tales Of series, but it suits the vision I had for Chris to the T.
Keep in mind this character won't be used in many preview images for chapters as I prefer to use art of male characters that best suit each chapters needs, so you'll still see a black line across the male characters eyes in these cases. You've got the name, the face, and the look. Keep this in mind when reading the series from here on! Also found characters that suit Gerald, the Warden, and Rose to the T as well, so keep these looks in mind as well. Ha ha, no, he's a fairly fit old man. But he tires out like the best of them pretty easily nonetheless, hence Gardevoir often taking on the task of pushing Chris in his wheelchair even though it's tasking due to her lacking sight. Although she also does it out of an unwillingness to let others take care of him deep down, asides recently but that was when she was recovering from the guilt and shock combination of smacking him so suddenly. Was gonna leave her title-less but it looked/felt weird, so I decided what they hey and put her name there as well. Although she'll have an actual name along with the others just before they leave the city. the picture of chris and Gerald? I know what game they came from and its one of my favorite ones. the picture of chris and Gerald? I know what game they came from and its one of my favorite ones. Yep, the Tales Of series. Xillia I believe. You can never judge a book by its cover. 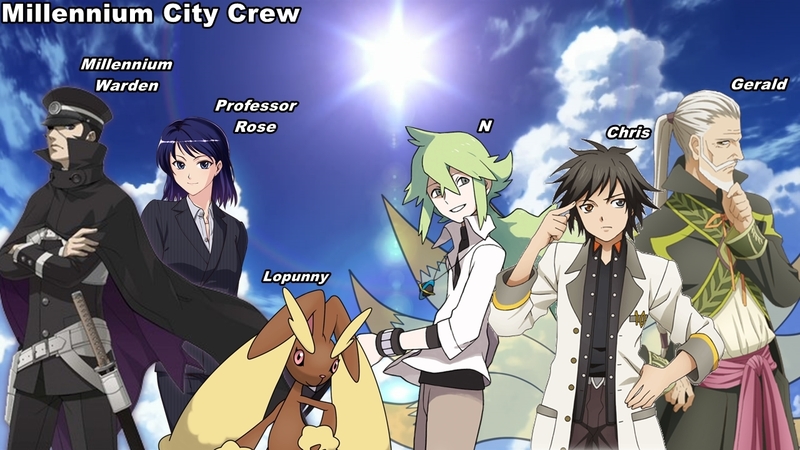 Correct, this image previews the Millennium City cast in a general way, as Buneary will be a Lopunny soon. I played Tales of Xillia, and now I'm at Tales of Xillia 2. Chris design is from the second and Gerald design from the first Game… Hope I don’t mix up the personalities of Chris with Jude and Gerald with Rowen, in both TOTGM and Tales of Xillia. Ha ha, good luck with that. Hopefully they will be distinct enough even with the same design. Hope you enjoy the choice as well! Even though Professor Rose look changed from CH58 preview image and in my imagination the Warden looked like Führer King Bradley from Fullmetal Alchemist. The concern that I mix Chris/Jude and Gerald/Rowen, is because they both play similar roles in some way. Jude is the main male protagonist from the first Tales of Xillia and Rowen is an old war veteran, after the war he worked as an attendant till he decides to accompany Jude. Ha ha, gonna be honest I know absolutely NOTHING about these characters, which in all honesty is why I picked them. The less I know of them the better for originality sake.